Say what you will about copyright law, it can lead to some seriously entertaining (and absurd) disputes. 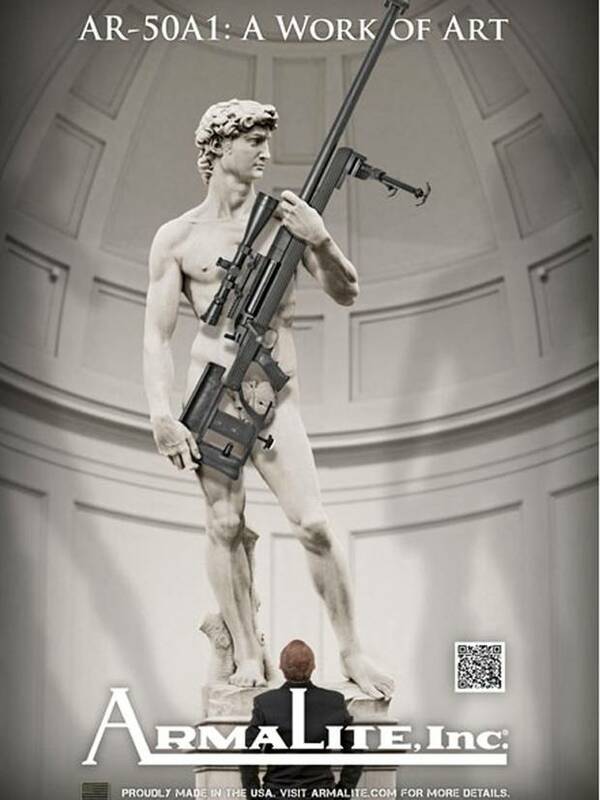 Take this week’s news story about American gun manufacturer ArmaLite Inc.’s use of an altered image of Michelangelo’s David in an ad promoting its .50 caliber AR-50 assault rifle. In the ad (reproduced above) the famous renaissance statue is depicted cradling the high powered rifle instead of its signature slingshot; a weapon which, had David had actually wielded it, would’ve allowed him to fell most of the Philistine army before lunch. The image has drawn harsh rebukes from the Italian government, and led to the Italian Culture Minister to call for the ad to be pulled, claiming: “an image of David, armed, offends and infringes the [Italian] law.” (loosely translated). The company may certainly be guilty of bad taste, but fortunately (or perhaps not) that’s not illegal in the U.S. Apparently though there remains some question about it in Italy. Now, I’m willing to overlook the question of how a statue depicting a legendary war hero in the throes of battle can become offensive by arming it, despite the not-so-secret fact that David was armed by the sculptor himself (albeit with a more primitive weapon) in order to accurately depict a solider moments before engaging and killing another solider on the field of battle. But let’s chalk up the offensive-when-armed comment to something lost in translation, or to a simple case of a misplaced comma, since I’m willing to concede that the ArmaLite ad doesn’t exactly break new aesthetic ground. What I’m more interested in is the second part of the statement; the part suggesting that the ad infringes the law. You see the Italian government, according to multiple news sources including the BBC, is claiming copyright in what may be the world’s most recognizable piece of marble. Not the particular picture of the statue that was used in the ad, mind you, but the statue itself. Which leads one to wonder how laws which didn’t exist when this work was created can confer copyright in the work to a government that didn’t commission it, and never assumed title to it. How do I know this for sure, you may ask? Because the country we now call Italy was a collection of rival city states during the time of Michelangelo, and didn’t become a unified sovereign nation until 1861, more than 350 years after the sculptor put his finishing touches on the masterpiece. Render unto Caeser that which is Caeser’s, indeed. But back to the copyright issue. Whether a local municipality or the central government turns out to be the statue’s true owner on paper, does that mean they also have copyright in said statue, granting them the exclusive right to display and prevent others from displaying it? I find that to be, as the Italians say, multo improbabile. Now I should point out that I am not an expert on Italian copyright law. However it taxes the imagination to come up with a plausible theory for how any variation of a body of law intended to confer moral and economic rights to artists to profit from and receive recognition for their artistic expression can possibly confer those rights to a sovereign for a work whose creator lived, worked and died half a millenia ago, and who had never even heard of the Kingdom of Italy during his lifetime. At some point a work of art, especially one as culturally and artistically significant as this one, must enter the public domain. Must it not? I mean, does the Italian Cultural Minister also believe that Emperor Nero impliedly conferred a copyright in the Coliseum to the Repubblica Italiana? Or is 1,000 years the limit on state-owned copyrights in Italy? As I see it, any legal action threatened by the Italian government regarding ArmaLite’s infringement of its David copyright is as devoid of legal merit as the ArmaLite ad itself is devoid of artistic merit. To argue otherwise would be absurd. Does the French government own a copyright in the Mona Lisa? Or the Egyptian government in the Sphynx? What about the right of the National Park Service to prevent Statue of Liberty knock-offs? These works are about as fixed in the public domain (and public consciousness) as works can be, leading me to the conclusion that this is more political theatre than substantive legal argument. But who knows for sure in a country where the courts are notoriously idiosyncratic. The truth be told, I’d like to read the legal brief supporting the Cultural Minister’s position. But not half as much as I would like to see the ArmaLite brass appear before an Italian Magistrato. The Amanda Knox fiasco wouldn’t hold a candle. At least ArmaLite had the courtesy to tastefully cover David’s scandalous private parts with a fig leaf, which if you look closely at the ad you can see. Funny, isn’t it, what different cultures consider offensive these days. UPDATE: Since initial publication of this article, sources with first-hand knowledge of Italian law have suggested that, contrary to published news reports, the government is not making a claim of copyright infringement, but rather is claiming that as “cultural heritage” the statute is subject to protection under the Italian Constitution, which forbids private use without permission. Interesting, I would only add something: Mona Lisa is Leonardo Da Vinci’s masterpiece. Leonardo Da Vinci was….Italian, not French!